On a recent visit, my friend Andy Grant brought over three of his new bitters recipes, including a bottle of Scelerisque et Absinthium – or chocolate & absinth. The mixture is remarkable – with a really warming, spicy flavour; the chocolate is really subtle, lending an almost creamy texture to the aniseed-like notes of the absinth. I thought this combination needed a cocktail of its own to show off in, and so began to think of flavours that match the base flavours: the absinth notes made me think of the Sazerac cocktail, and the chocolate reminded me of rum. 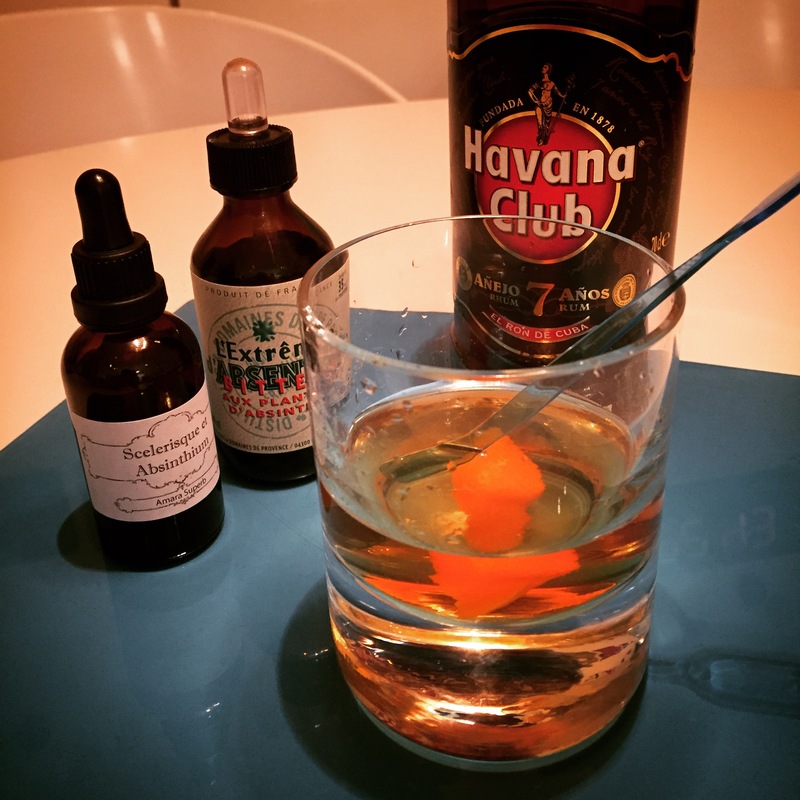 So, I elected to make a variant of the Sazerac cocktail, using rum as a base. The end result is really very good, even if I say it myself: there is a creamy flavour from the rum and chocolate, and a mysterious note from the layers of absinth. It’s a pretty strong drink, but one to be sipped and enjoyed. The whole is dedicated to Andy & his excellent bitters. Chill the glass. Muddle the sugar cube with the Extreme d’Absente bitters (if you are using regular Absinthe, then rinse the chilled glass with a few drops of the Absinthe and drain) in your mixing glass. Stir the rum together with the chocolate & absinth bitters and ice in the sugar mix and strain into the chilled Old Fashioned glass. Garnish with a large slice of orange peel.